Experts Think UBI Is the Solution to Automation. This Year, We’ll Find Out. The future of work hangs in the balance. Dismissing vague warnings that robots are coming for our jobs is pretty easy. Not so easy? Dismissing hard evidence that they’ve already arrived and are doing those jobs better and more cheaply than we ever could. Those are the facts the workers of the world faced when news broke earlier this year that a Chinese factory increased its production by 250 percent and dropped its defect rate by 80 percent by replacing 90 percent of its human workforce with automated machines. In fact, the transition to machines has been so successful, the plant may soon cut its remaining workforce from 60 to just 20 human workers. That factory is just one example of how automation is putting the future of human labor in jeopardy. Experts are predicting that up to 47 percent of jobs in the United States may be replaced by automated systems—and that’s all in the next decade. If that’s not enough, manufacturing jobs aren’t the only ones at risk. Automated systems are proving that they are capable of handling everything from “low-skill” work like flipping burgers and driving taxis to white-collar professions like managing hedge funds and preparing tax returns. Researcher after researcher has concluded the same thing — automation is going to put a lot of people out of work very soon — but what people can’t agree on is what we should do about it. Some, like President Barack Obama, recommend focusing on education and training to prepare people to take on new types of jobs once their jobs are replaced. Others recommend putting systems in place that would make having a job a guarantee. Still others think a tax on robots could be the solution. 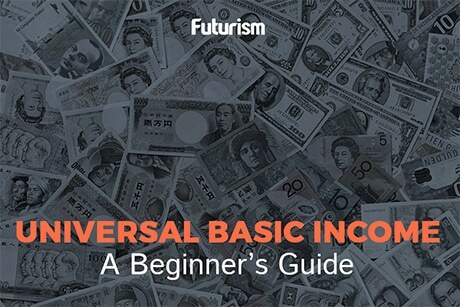 Perhaps the most seriously discussed option, however, is universal basic income (UBI). The idea behind a UBI system is that every member of a society regularly receives a set amount of unconditional money from the government or a public institution. How much money, how often it is given, who supplies it, and other variables are all open to interpretation. Proponents of such a system say its benefits would be multifold. With so many people expected to lose their jobs in the coming decades, UBI would be a way for the government of a country to ensure it doesn’t see a drastic increase in poverty due to unemployment. They point to the encouraging results of past studies in their support of UBI, noting how some trials have revealed a link between UBI and better health, while others have noted a drop in the usage of “temptation goods” like alcohol and tobacco in societies with a UBI in place, particularly if those societies are in underdeveloped nations. While notable figures such as Tesla CEO Elon Musk, Y Combinator president Sam Altman, and eBay founder Pierre Omidyar have all expressed their support for UBI, just as many people remain on the other side of the debate. Business mogul Mark Cuban simply called UBI “one of the worst possible responses” to automation, philanthropist Bill Gates said even the richest countries couldn’t afford such a system, and the Obama administration released a report stating that job training and job search assistance are much more likely to mitigate the potential unemployment situation than UBI. Others argue that UBI would discourage people from working, wouldn’t be enough to lift them out of poverty, and would result in immigration problems for countries that enact such systems. Until recently, we’ve had very few examples of UBI systems to look to for definitive proof of their potential benefits or burdens. Those examples we did have involved smaller groups of people for relatively short durations of time. What we need to move forward are more extensive trials involving larger groups, and thankfully, that’s what we’re finally getting. This year, Finland kicked of a two-year UBI trial in which 2,000 randomly selected citizens each receive the equivalent of $587 a month. Each participant was already receiving unemployment benefits or an income subsidy from the government that they would lose if they started earning outside income. The hope is that the UBI will encourage those people to take chances on potentially risky job offers, like those at tech startups, knowing they’ll still have an income to fall back on. Once the two-year trial is over, the government plans to compare the data it collects from the 2,000 participants and 173,000 non-participants from a similar background to determine if a larger UBI system would be economically worthwhile. GiveDirectly is poised to launch the largest UBI program to date this spring. With the support of investors like Omidyar, the nonprofit will provide UBI to more than 26,000 Kenyans, with the total amount dispersed expected to hit around $30 million. The company is spreading the money across 200 villages, with recipients grouped into one of three potential systems. Some will receive 12 years of basic income, some will receive two years of it, and others will receive two years’ worth of income as a single lump sum. Kenyans in 100 villages will act as the control group against which the results of the trial will be judged. GiveDirectly is hoping to learn a great deal about UBI from the study, including how it affects a person’s economic status, willingness to take risks, and their gender relations, particularly in terms of female empowerment. Canada has its own UBI project set to launch this year. In December, the state legislature of Prince Edward Island (PEI) approved an initiative to test out a UBI program, with leaders of all four political parties in the province approving the measure. The details still need to be hashed out and the plan implemented, but with 150,000 citizens, the small Canadian province could prove to be the perfect setting for a UBI pilot program — large enough to provide a valid sample size but small enough to be logistically feasible. With so many projects in place, 2017 is being touted as the year we’ll finally find out if a UBI system could work, and really, we have no time to waste. That Chinese factory may have been one of the first, but it certainly won’t be the last example of automation’s superiority in the workplace.